I met with a couple of new clients yesterday - two sweet little girls, one 6 years old and the other 8. You know those are my favorite kinds of clients! They are switching from sharing a room to each having their own room and they both needed new bedding and some organization. So I did what I always do on a first meeting, I asked a lot of questions (what is your favorite color?) and took measurements and photos and told them I would get back to them when I had a plan. They told me they liked blues and greens and one said she loved owls. And as I was leaving, of the little girls asked me if I would have it done tomorrow! Don't you love that? It was an evening appointment and it had already been a long day but I was right by HomeGoods and thought I would just stop in to see what they had. If you shop at HomeGoods you know it is pretty hit or miss. Sometimes they have a lot and sometimes nothing. Last night - they had A LOT! 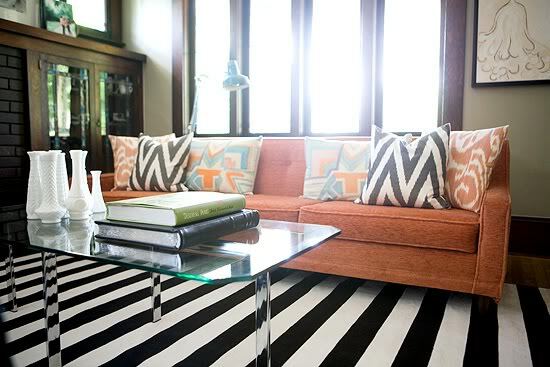 Kirsten from 6th Street Design School is featuring my home today on her blog. She was so sweet to contact me last week saying she had recently come across my blog and liked my style - and wanted to know if she could feature my home in her Feature Friday series where she posts different blogger's home tours. I should have been flattered ... but honestly, the first thing I thought was - "she has no idea what my house looks like ... I THINK SHE THINKS ONE OF MY CLIENT'S HOMES IS MINE!" (I mean seriously, does she know that I have a 23-year-old kitchen with the worst granite EVER?) I wrote her back telling her just that and she agreed that she had just skimmed through quickly and she wasn't really sure if she had seen my work or my home. I sent her some photos and I guess I passed the test (or she felt bad saying never mind!) so if you want to see a bit more of my house than I have been brave enough to share before (well, not my entire home, but you can see my really old kitchen), click here. I always want to disclose to future clients that what you see in my home is not what I would do for them, and while years ago I would bring clients to my home to show them examples of certain design ideas, now I think I should have them over to show them what not to do (no, we do not use a million 6" recessed can lights in the ceilings any more). At first I really didn't want to was afraid to share my home especially after I went through and looked at all the other homes she has featured (they are amazing!) but going along with the whole "be authentic" and the Things I Am Afraid To Tell You movement I decided I would just be brave and let you see. Well, not that brave because I didn't show you the bedrooms or two of the baths. Trust me, they are not worth seeing; there is no inspiration there people I promise. At any rate, you should definitely check out Kirsten's blog - she is an incredibly talented designer (and so young and cute) and if you have time go through all her Feature Friday posts - there are some stunning homes for you to see! Agreed its so much fun to do a little girls room! I love those owl bookends.. adorable.. and I am an owl nut! Found you via 6th street! Your home is beautiful! Oooh...little girls are the best clients. I just worked on an e-design for some young girls and it was so much fun!! And with my daughter being young I can't wait until I can help her design her room b/c I know there will be a short window of when I can help and when she'll have her own opinions. You got some great stuff at HomeGoods - and you're right it's very hit or miss - but you HIT. How fun. And I'm so excited to see you featured at 6th Street. 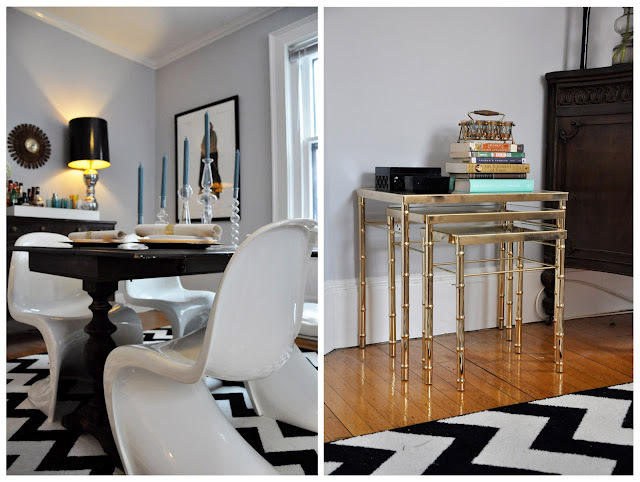 Did you know I worked with Kirsten last year on my living room e-design? She was great and I'm so happy I did that. Can't wait to check out your home tour Sherri! Are you kidding? Your home is beautiful! I love the white sofa idea! And the pillows are gorgeous. I have similar kitchen cabinets and love the glass fronts you did in some of them. I also love the stainless island idea. That would work great for us too! You have great talent. Congrats on the feature. I also love the new design plan for your clients. They will love it! So fun to have found your blog through 6th Street Design School. I am now off to peruse all your beautiful pics! So happy to have found you from 6th street. I am so in love with your home. You are crazy to think it wasn't up to snuff! It was my favorite friday feature and I'm not just saying that. I loved it. And how fun is your stash from the girls room!? Congrats on the feature, Sherri. You deserved it. I enjoy touring your home at 6th Street very much! 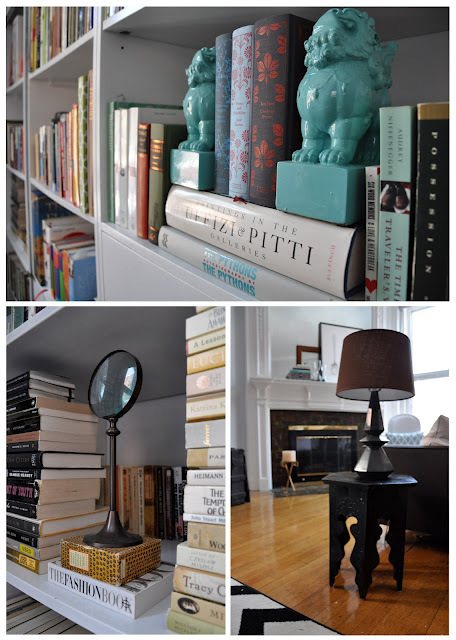 I love the adorable owl bookends and the green pillow you picked for your young clients. You definitely found a lot of great stuffs at HomeGoods! Found you via 6th street and just wanted to tell you your home is beautiful! Loved what you picked up for your young clients, looks like they are going to have stylish new digs! Oh yeah.....what a cute design plan for the girls. Seriously you found all of that at HG??? They never have good stuff at mine. I am laughing at your honesty about your home! Emily Clark has asked me if she could feature my house on her blog and I said, not now but once I redecorate! LOL! I feel your pain but your house is beautiful ! Isn't Kirsten great! I love her blog too! I think kids rooms are also so fun to work on!! I picked up the owl bookends too last week at Home Goods along with many other items for a nursery and playroom I'm working on. Love your blog. I'm your newest follower. Wow you scored at Home Goods! Going to vista your tour on Sixth Street now. Are you kidding me?? I'd be in heaven if my home looked as amazing as yours! Absolutely perfection!